If people wait until the end of Yom Kippur to say kiddush levana for the month of Tishrei, which I understand to be a prevalent custom, do they keep their talleisim on? Since the tallis is not supposed to be worn at night except for maariv on Yom Kippur (see, for example, here), does that mean that people should remove them before going outside? Or is it purely a matter of personal choice? Seems to me that everybody in this painting is wearing a tallis, which leads me to suppose that it must (?) be the end of Yom Kippur. 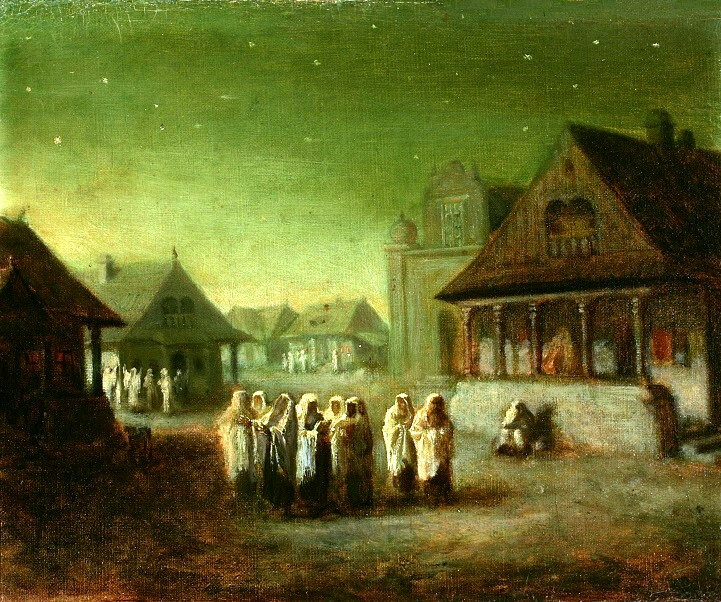 The painting is entitled "Powrót z synagogi; Kiddusz Lewana - Poświęcenie księżyca", which (according to Google Translate) means something like "Exterior of the Synagogue. Kiddush Levana: Blessing of the Moon". It appears on Wikipedia's Kiddush Levana page. The artist's name was Wacław Koniuszko (1854-1900). He was a Polish artist whose artworks are today exhibited in the National Museum in Warsaw. Amongst other things, he was famous for painting the Jews of Kazimierz. I do not know whether or not he, himself, was Jewish, but even if not one might assume that he painted from what he saw. (1) Is there a custom to don a tallis for kiddush levana on any night of the year other than motzaei yom kippur? (2) Is there a custom to keep the tallis on after davening maariv on motzaei yom kippur for the sake of kiddush levana? (3) Or, is it all really just a matter of personal preference, and it makes no difference whether or not a person is wearing a tallis at such a time? Browse other questions tagged minhag tallit-gadol kiddush-levanah .